Explore the Internet and some of the vampire books we have in the classroom. 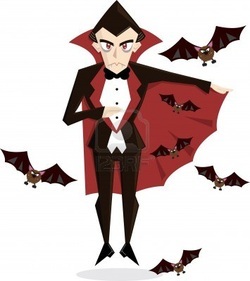 Find a variety of different images of vampires and collect your findings on this GOOGLE DOC. When you enter your idea, put your name in brackets after it along with the place you found your idea. Try not to repeat something that has already been stated. Using the ideas collected on the GOOGLE DOC, draw and colour your own graphic representation of what you think vampires look like. Give the image a title and label it clearly. Take a photo of your image and upload it to Fotobabble. Record a short speech (1-2 minutes) that clearly explains your choices and why your vampire looks like it does. Refer to the places you got your ideas from. Share your completed Fotobabble link onto the forum below by clicking REPLY and using the link button. Include your name. Listen to at least three other Fotobabbles, and add some feedback (two stars and a wish) to each on the forum. Think you know how to spot a vampire AND kill one? Do you understand where Bram Stoker got his ideas from for the character Count Dracula?